The Elite Daily founders are all under 30. Elite Daily, a news website with 55 employees and 40 million monthly uniques, just raised a $1.5 million convertible note (a type of debt) from Greycroft, Vast Ventures, Red Sea Ventures, and angel investors. The funding is the first outside capital the startup has ever raised. 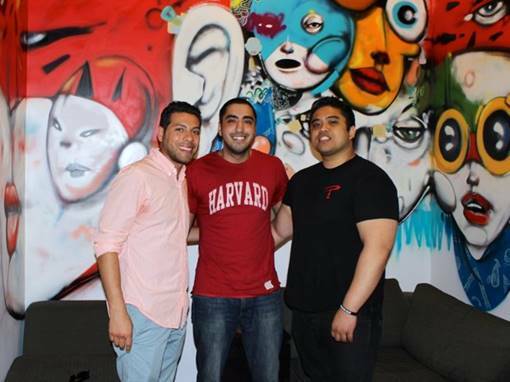 Three founders, who are all younger than 30, built a media property that rivals traffic of sites such as Upworthy, Wall Street Journal and even Business Insider in just two years on a bootstrapped budget. While undergrads at Pace University, David Arabov, 25, and Jonathan Francis, 28, pooled together $60,000 with another friend, Gerard Adams. None of them had media or technology experience, but they had a lofty ambition to create The Huffington Post for millennials. They launched Elite Daily as a WordPress blog in early 2012 and nine months later, they had their first month with one million unique visitors. Last December, Elite Daily’s traffic soared to 41 million monthly unique visitors and the company finished the year with $400,000 in profit. Elite Daily is one of a few new media companies that has risen from obscurity to tens of millions of readers in a short period of time. Upworthy grew from no readers to 8.7 million in eight months; it has raised $12 million. ViralNova, a one-man blog, grew from launch to 100 million readers in seven months without any funding. PolicyMic, an Elite Daily competitor, has tens of millions of monthly unique visitors and it has raised $15 million. Arabov says his site’s fast growth is the product of trial and error, Facebook traffic surges, having a strong advisory team, and hiring a CTO who custom-built powerful analytics tools. Strategic advisors include the first investor in Tumblr and one of Bleacher Reports founders. An Elite Daily employee at work. The average age of employees there is 23. The first article Elite Daily wrote that exploded was in May 2013. One of its writers read an interview with the CEO of Abercrombie & Fitch on Business Insider and pulled out a post that attracted more than 1 million readers titled, “Abercrombie & Fitch CEO Explains Why He Hates Fat Chicks.” Around that same time, Elite Daily recruited a CTO from ad tech company AppNexus who built the company a more robust CMS with more ways to measure successful posts and to surface potentially-successful story topics. By the fall, Elite Daily was drawing in 7 million monthly unique visitors. By December, the site exceeded that monthly traffic when a video of a family singing in Christmas pajamas went truly viral and raked in 12 million uniques in a single day. Arabov remembers putting the Christmas pajama post on Elite Daily’s Facebook page around midnight following a company holiday party. When he woke up, there were 50,000 people on Elite Daily’s website. A few hours later, 80,000 readers were on the site at once. Elite Daily also takes advantage of a contributor model, which was made popular by The Huffington Post. It accepts articles from people all over the world who are willing to write for Elite Daily for free. Two contributors editors manage the free content and make sure the quality is high enough to publish. Some of Elite Daily’s impressive traffic is paid for, although the company says most of it is organic. “We only boost some view articles that we know are about to go viral and we give them a boost,” says Chief Strategy Officer Miguel Burger-Calderon. Many sites, including BuzzFeed and ViralNova, pay to boost posts on Facebook too. For the past five months, Elite Daily’s traffic has leveled off at about 35 million uniques although June is trending toward its highest month yet. The site is seeing a healthy mix of direct traffic (20%), SEO (20%) and social (60%) of which 50-55% comes from Facebook. Elite Daily’s unique visitors traffic goal for the end of 2015 is an ambitious 150 million. Fueled with millions of dollars for the first time ever, Elite Daily is hoping to keep its already-high traffic surging. When leaving the interview at Elite Daily’s Park Avenue office, I noticed a small poster that hung on the startup’s wall. Although he said it with a smile, Arabov was serious. After all, his team has a knack for achieving lofty goals, even though the average employee is only 23 years old.